Proximal interphalangeal joint (PIP) is the most common ligamentous injury in the hand, ranging from simple sprain to fracture dislocation. The fracture dislocation of the PIP is notoriously unforgiving injury, with potential long-term squeals of residual pain stiffness, deformity, and premature degenerative arthritis. It is purported to occur in 1–10/100,000 patients. There is often a delayed presentation of between 2 and 4 weeks and is often mismanaged and misdiagnosed as a “jammed finger.” This injury mostly occurs in sports activity. In our study, the most injuries occurred through by cricket ball hits directly on extended fingertip. This is also most common mechanism of this injury, i.e. direct axial load applied on tip extended finger. There are numerous variable treatment options for PIP fracture dislocation available in literature such as extension block splinting,, extension block pinning, K-wire joint transfixation, external fixation,,, dynamic traction,,,,, open reduction internal fixation,,,,, volar plate arthroplasty,,,,,, and hemi-hamate arthroplasty. Each of these procedures has been reported to generally provide functional outcome for the unstable injuries. The purpose of our study is to evaluate the functional outcome of volar plate advancement arthroplasty in unstable fracture dislocation of PIP joint injury. Functionally, the PIP joint is a pure hinge joint. Its stability results from articular congruence and the surrounding soft-tissue structures such as volar plate, capsule, collateral ligament, i.e., proper and accessory, and extensor central slip. The proximal phalanx head which is correspondingly trochlea shaped with the facet on the distal and flexor surface, along with this base of middle phalanx which has cup-shaped volar lip engages with the head of proximal phalanx. This congruence affords inherent intrinsic stability to the joint, especially in an axially loaded finger. The volar plate limits hyperextension, whereas the collateral ligaments contribute to varus-valgus stability. For dislocation to be occur, the volar plate and at least one of the collateral ligaments must be injured. These injuries are classified by their mechanical stability as well as the percentage of joint surface fracture. Injuries are categorized as stable or unstable, which guide nonsurgical versus surgical treatment. Dorsal fracture dislocation is mostly unstable in full extension. Either fracture involving <30% of the volar articular surface of the middle phalanx or remain concentrically reduced with 30° or less of flexion are generally stable and treated nonsurgically, whereas fracture involving >30% of the volar articular surface of the middle phalanx and required >30° of flexion to maintain reduction is unstable injury and treated surgically. This is a retrospective study of small number 10 case series conducted between December 2013 and March 2017, presented with fracture dislocation of PIP (PIP). There were eight male and two female patients. The average age was 26.9 years (range: 18–38 years). In four cases, it was index finger, in three, it was middle, and in three, it was ring finger involvement. In most cases, the mode of injury was during playing by cricket ball and rest in two are other causes. Volar plate arthroplasty used as a primary procedure in three case which presented within 2 weeks of injury and as a reconstructive procedure in seven cases which presented late (after 6 weeks) with jammed deformed finger [Table 1]. The average duration after injury was 5.3 weeks (range: 2–8 weeks). The inclusive criteria for surgery were close injury, >40% involvement of volar articular surface with comminution of middle phalanx, unstable injuries, i.e., required >300 of flexion for concentric reduction, and good neurovascular status. The exclusion criteria were compound injury, <40% involvement of volar articular surface, stable injury, poor neurovascular status, old age (above 60 years), and longer duration (>2 years) [Table 1]. Examination begins with the inspection of the finger, noting any swelling, deformity, and tenderness. Palpation should be performed, paying attention to exact site of tenderness. The neurovascular status should be clearly checked. Both active and passive range of motion (ROM) should be evaluated and recorded [Figure 1]a and [Figure 1]b. Radiograph including both true anterior-posterior and lateral view should be done [Figure 2]a and [Figure 2]b and document dorsal “V”sing for subtle instability in true lateral view. Examination should be done under metacarpal block with fluoroscopy and note the position of flexion of PIP joint necessary for concentric alignment and also note that PIP joint flexion is either the result of gliding or hinging movement. The limb is prepared and draped with sterile technique under a pneumatic tourniquet; the PIP joint is exposed through a radially based volar chevron-shaped incision [Figure 3]a. The flexor sheath is excised between the A2 and A4 pulleys, and flexor tendon is atraumatically retracted [Figure 3]b. In acute case, hyperextension of the joint facilitates the visualization of distal edge of the fracture fragment and entrance into the joint. The volar plate, still attached to the fragment of middle phalanx, is incised along its lateral margins, detaching it from the collateral ligaments, and the bony fragments are removed from distal edges [Figure 3]c. To gain optimal exposure, the collateral ligament except volar most remnants (later use for repair with volar plate) is excised. In late cases, the volar plate is divided transversely as far distally as possible, leaving some periosteum, if necessary, to create a pedicle of maximum length for advancement into the joint. It is mandatory in late cases to completely excise the both collateral ligaments. By this, the joint can be maximally hyperextended as a shotgun. Create a transverse trough across the volar portion of the articular surface of the middle phalanx. Failure to create a trough, completely across the phalanx may result in subsequent angular deformity. Deeply impacted fragment may be left undisturbed to serve as a buttress for the volar plate [Figure 3]d. It is important now to reduce and test the range of the joint, the fingertip should be easily touch the distal palmar crease with PIP joint in 110° flexion. If such flexion is not possible (in late cases), dorsal joint capsule release may be necessary. A pull-out suture (Prolene no. 1), catching the lateral margins of the volar plate, is placed so that the ends emerge from each distal corners [Figure 3]e. If the volar plate cannot be adequately advanced distally up to 4–6 mm, the proximal checkrein ligaments are step cut partially and release to gain sufficient length for advancement. Now, two small drill holes are placed in the lateral most portion of the trough in the middle phalanx as proximal as possible. The pull-out suture is then passed through these drill holes to emerge dorsally in center through the triangular ligament of the extensor mechanism to avoid binding down the lateral bands with keeping the dip joint in 30° in flexion. Traction on the suture draws the volar plate into the articular defect, effectively resurfacing the joint and simultaneously reducing the middle phalanx. The joint needs not to be flexed >30° to maintain reduction. An intraoperative lateral radiograph should be obtained to check congruity of reduction [Figure 3]f. The pull-out suture is tied over a button and a K-wire is inserted to maintain stability [Figure 3]g. Secondary suture is placed between volar plate and collateral ligaments. Postoperatively, K-wire is removed at 3 weeks [Figure 4] and active guarded flexion of PIP joint is started with extension block splint. If complete extension is not achieved up to 5 weeks, a dynamic splint is given and pull-out suture is removed. Sport activity started at 8 weeks with buddy taping which is continued up to 4–6 months. Our study shows the result of volar plate advancement arthroplasty in fracture dislocation of pip joint in small no. of rare 10 cases series. The result were evaluated in terms of improvement in range of motion at pip joint, improvement in pain and swelling, and any residual deformity like fixed flexion contracture at pip joint or persistent dorsal subluxation. Out of 10 cases, 3 cases operated with in 2 weeks considered as a fresh case and 7 cases operated after 6 week considered as late cases where this procedure done as reconstructive surgery. The average follow up of our study was 20.6 months(range 16-28 months). At each follow up ROM and radiograph had been done (at 4w,8w,12w,6m interval ). The average preoperative ROM in late 7 cases were 15.7° (range 10°-25°) and in fresh cases ROM were not noted due to swelling and pain. The postoperative average ROM in fresh cases were 90° and in late reconstructive cases were 72°. The average gain in ROM in fresh cases were 90° [Figure 5]a and b] whereas in late cases improvement were 57° [Table 2]. The over all result in fresh case were considered as good and in late cases 4 shows good and 3 shows fair results. Both group shows functional improvement in range of motion of PIP joint without impairment in daily activity of living. The most common complication of the study was flexion contracture of 5°-0° noted in 7 cases; out of seven cases, four improved to full extension after long physiotherapy, and in 3, it persisted (not bothersome). Angular deformity noted in two cases of 5°; it was mild and without functional impairment and no requirement of middle phalanx osteotomy. Stiffness of DIP joint was also noted in three cases, but no intervention required. Redisplacement occurred in one patient due to failure of pull-out suture, was reoperated on, and regained satisfactory motion. Pain with stress was present only in two patients. Other complications such as infection, K-wire migration or breakage, and neurovascular problem, were none. Statically analysis was not possible due to a small number of cases. The term jammed finger used for neglected fracture dislocation of PIP. Although this injury is not very common, treatment is often mismanaged due to lack of proper hand surgeon in developing country or treating it in plaster by general orthopedic surgeon. Today, a variety of treatment procedure available, but it is very difficult to understand which treatment modality would be appropriate for different presentation of PIP fracture dislocation. Advancement volar plate arthroplasty is the procedure of choice when there is a comminuted volar lip of middle phalanx with >40% of articular surface involvement with unstable reduction means requiring >30° of flexion to reduce PIP joint. A novel technique introduced by Hasting in1999, Williams et al. is Hemi-hamate arthroplasty is a reconstructive procedure of choice when there is extensive articular comminuted involving >50% articular surface. According to author increased risk of resubluxation in volar plate arthroplasty make this is a better option. In our study, resubluxtion is not a problem. The most recent result was compiled from 22 patients at a mean of 5 years (Calfee et al. presented at the annual meeting of American Hand surgEon Society in 2008) with average ROM at PIP joint was 19°–89° with minimal pain and instability at carpometacarpal joint. Extension block splint is another technique indicated when the size of volar fragment is <40% and requiring no >30° of flexion for reduction, but there should be some residual collateral ligament intact, no articular incongruity, and stable joint. For this, patient should be cooperative and complained. McElfresh et al. produce a good result. Alternatively, an extension bloc (Pinning) K-wire may be used in condition when there is swollen and short finger not maintain splint or patient is not cooperative. Dynamic skeletal traction is best used in pilon type fracture or unstable injury with several small fragments constituting 30%–50% of the joint surface. It uses the principle of ligamentotaxis with the help of K-wire and rubber assembly or small fixator.,,,, The advantages of traction are simultaneously reduction and movement of PIP joint. Ruland et al. operated 34 patients (26 of dorsal fracture dislocation and 8 pilon type) and regained 88° arc of PIP joint motion and 60° arc motion at DIP joint. Pin tract infection is only their complication. Disadvantage of dynamic traction is a regular diligent follow-up to ensure that adequate joint reduction is maintained and fixator is cumbersome to wear, interfere with care, and mobilization of adjacent swollen finger. Open reduction and internal fixation (ORIF) is best situated in the acute case and with single large fragment. It is technically demanding procedure even in expert hand. The fracture can be approached through both volar and dorsal incision. Hamilton et al. repaired volar fracture fragment in 9 patients and get 85° motion at PIP joint with universal residual flexion contracture. Lee and Teoh reported 12 patients by dorsal approach and get 85° motion at PIP joint. The complication with ORIF is residual flexion contracture, extensor lag, pain, swelling, and cold intolerance. Volar plate advancement arthroplasty solves two problems. First, it provides a volar restraint to maintain reduction while simultaneously resurfacing the irregular or deficient volar articular surface of middle phalanx. Second, by excision of bilateral collateral ligament, it improves the appearance of a swollen finger in late cases, yielded an improvement in final ROM over early cases in which the ligament was left, got optimum exposure without loss of lateral joint stability. Volar plate advancement arthroplasty is also a variant of interpositional arthroplasty, and the material is vascular fibrocartilaginous pedicle, and this may be responsible for joint remodeling which has been observed in follow-up period. Because the volar plate is actually stretched around the condyles of the proximal phalanx, it assumes the exact contour of the surface on which it glides. Bone and fibrous tissue form on the distal surface to complete joint remodeling. Volar plate advancement arthroplasty gives a good functional result, but it has some complications such as flexion contracture, DIP joint stiffness, subluxation of PIP joint, angular deformity, and pain on stress. However, these can be avoided or minimized by some precautions. Flexion contracture at PIP joint postoperatively, although mild degree, is because of immobilization of PIP joint in >30° of flexion or failure to begin dynamic extension splinting by 5 weeks. Recognition of this potential and common problem should help minimize it. Even with early motion and formal hand therapy, a very few degrees of flexion contracture remain. Angular deformity is because of asymmetric impaction of the base of middle phalanx or failure to create a trough for the volar plate that is long axis to the middle phalanx. Although it is mild in nature and functionally not significant, if patient is not satisfactory, a corrective middle phalanx base osteotomy is required. Failure to flex the DIP joint approximately 30° or impaling the lateral bands while passing the pull-out suture through the extensor mechanism on the dorsum of middle phalanx may cause limitation of DIP joint flexion. To prevent this, we should start dip joint motion vigorously and immediately. Modification of the technique like using anchor suture instead of pull-out or using two separate sutures at both sides of volar plate and tying the suture beneath the skin dorsally. Recurrent dorsal subluxation may be either due to failure of pull-out suture, not achieve stable reduction, or inadequate protection to prevent extension during mobilization. One cause of failure of pull-out suture is damage from transarticular K-wire fixation. This complication may be obviated by prepositioning of the K-wire in the middle phalanx after Keith middle passage but before the suture pulled through. Infection is not seen in our study. This procedure is best situated for a patient who suffered from a close fracture dislocation of PIP joint, either fresh or chronic (neglected), comprising >40% of volar lip of middle phalanx with comminution with good neurovascular status. In our study, the result is very good with a functional range of movement. Hamer DW, Quinton DN. Dorsal fracture subluxation of the proximal interphalangeal joints treated by extension block splintage. J Hand Surg Br 1992;17:586-90. McElfresh EC, Dobyns JH, O'Brien ET. Management of fracture-dislocation of the proximal interphalangeal joints by extension-block splinting. J Bone Joint Surg Am 1972;54:1705-11. Viegas SF. Extension block pinning for proximal interphalangeal joint fracture dislocations: Preliminary report of a new technique. J Hand Surg Am 1992;17:896-901. Newington DP, Davis TR, Barton NJ. The treatment of dorsal fracture-dislocation of the proximal interphalangeal joint by closed reduction and Kirschner wire fixation: A 16-year follow up. J Hand Surg Br 2001;26:537-40. Krakauer JD, Stern PJ. Hinged device for fractures involving the proximal interphalangeal joint. Clin Orthop Relat Res 1996;327:29-37. Khan W, Fahmy N. The S-quattro in the management of acute intraarticular phalangeal fractures of the hand. J Hand Surg Br 2006;31:79-92. Bain GI, Mehta JA, Heptinstall RJ, Bria M. Dynamic external fixation for injuries of the proximal interphalangeal joint. J Bone Joint Surg Br 1998;80:1014-9. Ruland RT, Hogan CJ, Cannon DL, Slade JF. Use of dynamic distraction external fixation for unstable fracture-dislocations of the proximal interphalangeal joint. J Hand Surg Am 2008;33:19-25. Ellis SJ, Cheng R, Prokopis P, Chetboun A, Wolfe SW, Athanasian EA, et al. Treatment of proximal interphalangeal dorsal fracture-dislocation injuries with dynamic external fixation: A pins and rubber band system. J Hand Surg Am 2007;32:1242-50. Badia A, Riano F, Ravikoff J, Khouri R, Gonzalez-Hernandez E, Orbay JL, et al. Dynamic intradigital external fixation for proximal interphalangeal joint fracture dislocations. J Hand Surg Am 2005;30:154-60. Johnson D, Tiernan E, Richards AM, Cole RP. Dynamic external fixation for complex intraarticular phalangeal fractures. J Hand Surg Br 2004;29:76-81. De Smet L, Boone P. Treatment of fracture-dislocation of the proximal interphalangeal joint using the Suzuki external fixator. J Orthop Trauma 2002;16:668-71. Hamilton SC, Stern PJ, Fassler PR, Kiefhaber TR. Mini-screw fixation for the treatment of proximal interphalangeal joint dorsal fracture-dislocations. J Hand Surg Am 2006;31:1349-54. Deitch MA, Kiefhaber TR, Comisar BR, Stern PJ. Dorsal fracture dislocations of the proximal interphalangeal joint: Surgical complications and long-term results. J Hand Surg Am 1999;24:914-23. Lee JY, Teoh LC. Dorsal fracture dislocations of the proximal interphalangeal joint treated by open reduction and interfragmentary screw fixation: Indications, approaches and results. J Hand Surg Br 2006;31:138-46. Grant I, Berger AC, Tham SK. Internal fixation of unstable fracture dislocations of the proximal interphalangeal joint. J Hand Surg Br 2005;30:492-8. Dionysian E, Eaton RG. The long-term outcome of volar plate arthroplasty of the proximal interphalangeal joint. J Hand Surg Am 2000;25:429-37. Malerich MM, Eaton RG. 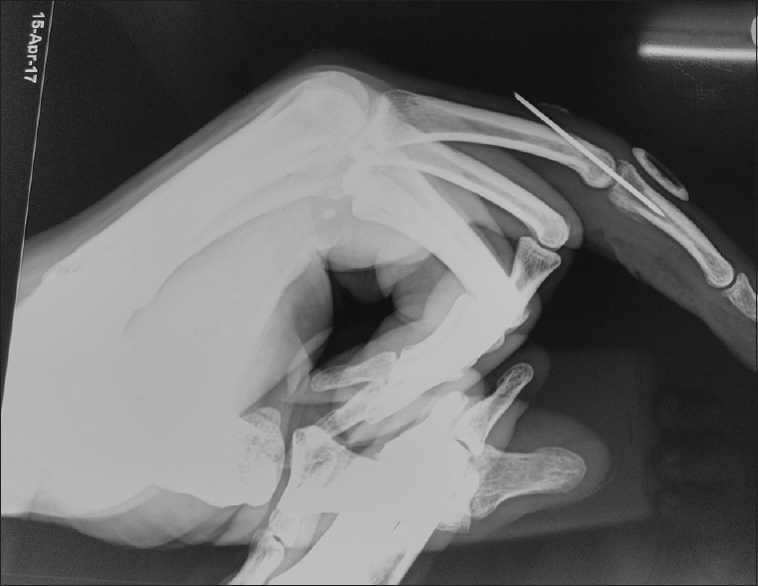 The volar plate reconstruction for fracture-dislocation of the proximal interphalangeal joint. Hand Clin 1994;10:251-60. Lee LS, Lee HM, Hou YT, Hung ST, Chen JK, Shih JT, et al. Surgical outcome of volar plate arthroplasty of the proximal interphalangeal joint using the Mitek micro GII suture anchor. J Trauma 2008;65:116-22. Durham-Smith G, McCarten GM. Volar plate arthroplasty for closed proximal interphalangeal joint injuries. J Hand Surg Br 1992;17:422-8. Eaton RG, Malerich MM. Volar plate arthroplasty of the proximal interphalangeal joint: A review of ten years' experience. J Hand Surg Am 1980;5:260-8. Williams RM, Kiefhaber TR, Sommerkamp TG, Stern PJ. Treatment of unstable dorsal proximal interphalangeal fracture/dislocations using a hemi-hamate autograft. J Hand Surg Am 2003;28:856-65. Sinnatamby CS. Last's Anatomy Regional and Applied. 10th ed. Edinburgh: Churchill Livingstone; 1999. p. 35-105. Bowers WH, Wolf JW Jr., Nehil JL, Bittinger S. The proximal interphalangeal joint volar plate. I. An anatomical and biomechanical study. J Hand Surg Am 1980;5:79-88. Kiefhaber TR, Stern PJ, Grood ES. Lateral stability of the proximal interphalangeal joint. J Hand Surg Am 1986;11:661-9. Page SM, Stern PJ. Complications and range of motion following plate fixation of metacarpal and phalangeal fractures. J Hand Surg Am 1998;23:827-32. Kiefhaber TR, Stern PJ. Fracture dislocations of the proximal interphalangeal joint. J Hand Surg Am 1998;23:368-80.